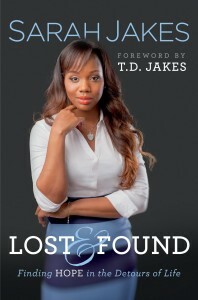 Lost and Found is truly a gem for every young women. After reading this book, I immediately wanted to share it with my friends. I honestly could not put it down and read it in record time. Sarah has a unique but common story as not everyone can say they are the daughter of world-renown preacher T.D. Jakes, but many can say they were teen mothers who made many mistakes early on in life. I could see myself in the pages of her book. If you have ever sought validation from the world, looked for love in the wrong places, wanted badly to be accepted, and had pressure to live up to others expectations then you will definitely enjoy this book. This story is truly something that should be read by all women. Trust you will not be disappointed and able to relate in some form or fashion. Find your copy at any Barnes and Noble, Family Christian Bookstore, Lifeway Christian Bookstore or Amazon.